MOSCOW, Idaho – Idaho senior linebacker and tight end Kaden Elliss was named to the Paul Hornung Award Watch List, the Louisville (Kentucky) Sports Commission announced Thursday. The Paul Hornung Award, presented by Texas Roadhouse, is given to college football’s most versatile player. Elliss earned All-Sun Belt accolades each of the past two seasons at linebacker and is a preseason All-Big Sky selection at linebacker ahead of the 2018 campaign. He enters his senior year with 228 career tackles, including 32 for loss and 10 sacks. Elliss has intercepted five passes, forced five fumbles, recovered three and blocked a kick. 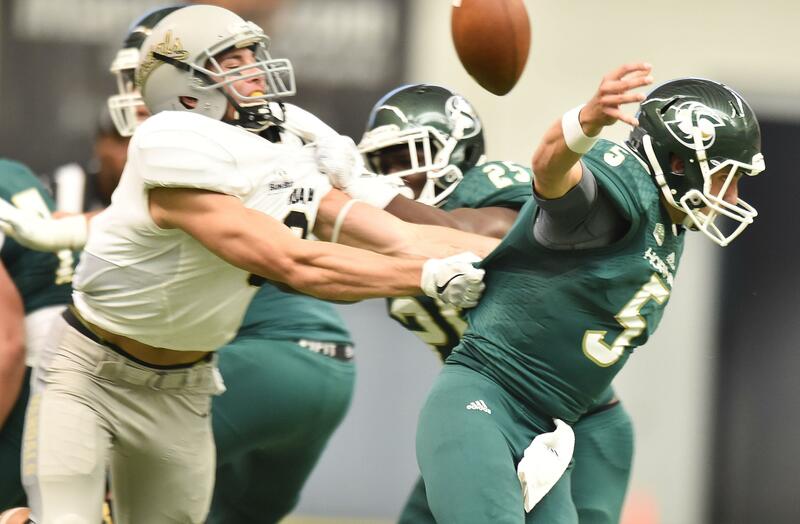 Elliss is expected to play an expanded role in the Vandals’ offense this season. He debuted on the offensive side of the ball last season, taking snaps at tight end, slot receiver and full back. He caught seven passes for 156 yards and two touchdowns. His versatility goes beyond simply playing both sides of the line of scrimmage. Elliss will line up at various positions on offense and defense. He is also a special teams weapon, blocking an extra-point attempt last season. Published: July 26, 2018, 4:57 p.m.